Drop a comment folks, and also sign up as a follower on the right side, Mahalo! When a technology fails...insiders who stand to benefit decide to trot out something similar but with a "this time it's different" flair. Whenever a lie spotter sees the "this time its different" approach, they ramp up their spidey sense. In the past, nuclear plants have taken advantage of economies of scale by placing multiple nuke plants next to each other. They can benefit from economies of scale by such things as a common perimeter defense system, a common overall security system, a common pool of skilled scientists and top level technical people, a common pool of trained mechanics and technicians, a common pool of transportation and receiving facilities, a common pool of electrical distribution to the consumer, a common pool of backup electrical and other cooling systems. Small "modular" nuclear reactors will NOT benefit from any of these economies of scale. But since big plants blow up, sometimes in nuclear type explosions like the prompt moderated criticality at Fukushima 3 building (we are not sure if it was the MOX filled spent fuel pool, of the MOX filled reactor itself). But since big plants blow up.....the nuclear cartel proposes that smaller and more widespread nuclear will be safer. To state the obvious, the SMRs or small modular reactors, will not have the same ability to field resources for security, operational expertise, local engineering expertise, and maintenance expertise. And a Carrington event which might knock out 20 large plants in a geographic area like the east coast, and cause evacuations from specific areas as they melt down. Well if the area was peppered with the joke of SMR, there would be less backup power and a widespread sacrifice zone that people would not be able to drive out of without taking a "husky" and eventually deadly dose. THE WHOLE ABSURDITY OF MAKE THEM SMALLER MAKES THEM SAFER, is a joke, a massive lie of the dying Bronto, the nuclear industry. Look at this promoter below, everything we need to be against, is everything he is promoting without fact or argument. “A bunch of things are having to be rethought. Things that we thought were against green, like nuclear and bio-technology and even geo-engineering are, in light of climate, actually now green,” Brand said. And finally I propose a new thoery that will alienate even the few UK citizens who used to come to the Nukepro. The more desperate a "Failed Empire" is, the more they refuse to look at the truth. See below, pageviews at Nukepro for Tuesday. Note that UK is not even on the list. 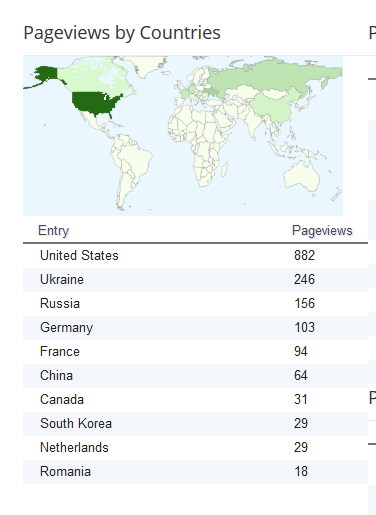 I get more visitors from Romania than the entire UK, more visitors from South Korea. The UK is so effed up, they refuse to even look at the truth. Think Sellafield. They don't even have the cajones to leave the European Union which is also failed. They seem to be enthralled with all that plutonium in their teeth, making for perfect smiles. Hang on a tic; that's not quite right. They generally have ugly teeth! LOL, ouch. I got plutonium from open air testing....shows how old I am. Max Keiser (of Russian TV - RT) wants to influence election there by kickstarter funding & Russel Brand. I keep thinking of the commercial with him & Stacey Hebert in the cockpit of a godzilla-like vehicle. That should go over well. Also Prozac in water, apparently. "Nukular" madness, too. Actually saw Fukushima mentioned in The Reg's comments lately (not the article though - [sarcasm]that just wouldn't be proper[/sarcasm]). As most Canduadian ISP traffic routes via the USeh, i don't expect iNet isolation like Blighty, except here in Candu-land. Once again, you'll likely know results long before i do, here on the (Adam) West Coast. Quote: "... no nuclear waste is created." No mention of purity of isotopes either. Safety testing? Pahhh! MVB might have some ideas as to how to check international viewability via proxy.